HP ProLiant ML310e Server. Server Powers on with No errors and boots to Bios. 2 x 500Gb Hard Drive. Product Title. Laptop batteries do not have warranty. After sales technical support is not available. Unit is New but unboxed. Unit only. This is a heavy item, I may include keyboard mouse and cables. HP ProLiant ML310e G8 Server. Pro Liant ML310e Generation 8. 3x 300GB SATA HDD - 900GB. HP RDX USB 3.0 Internal Disk Backup System. Hard Drive. Optical Drive. Hard Drive - 3x 500GB HDD 1x 1TB HDD. Machine Type - Server. Available for sale is a HP Proliant ML310e Gen8 V2 G8 Tower Server (Xeon E3-1240 V3 / 8GB / 500GB / B120i) 31E. This item is tested and working, and has been reset to factory defaults. It also includes 2 drive blanking plates, so it has 1 missing. HP ProLiant ML310e G8 Server. Pro Liant ML310e Generation 8. 3x 300GB SATA HDD - 900GB. HP RDX USB 3.0 Internal Disk Backup System. Hard Drive. Optical Drive Quad Core Processor. HP ProliantML310e G8 v2. We are able to source hard to find parts for Legacy systems through to the latest new in box parts for the latest generations of servers & storage systems. 4x Drive caddies. DVD RW Optical SATA Drive. 2x 500GB SATA. HP ProliantML310e G8. We are able to source hard to find parts for Legacy systems through to the latest new in box parts for the latest generations of servers & storage systems. DVD RW Optical SATA Drive. HPE ProLiant ML310e Gen8 v2 Xeon E3-1240 V2. We will resolve the problem directly with you. Model No: Proliant ML310E Gen8. 1 x Processor Slot Total. Motherboard:P/N: 686757-001. Optical: DVD Rom Drive. Storage: Unpopulated (2x 3.5" Non-Hot Plug Caddies With Silver Trays P/N: 652998-001. ). HP ProLiant ML310e G8 Server. Pro Liant ML310e Generation 8. HP RDX USB 3.0 Internal Disk Backup System. Hard Drive. Optical Drive Quad Core Processor. Model : ML310 G5. HP464187-001 ML310 G5 HHD Back Plane Board. HP System Board 450120-001 - HPN: 454510-001. Hard Drive -None included. This item has been fully refurbished by our qualified technicians, and has passed all diagnostic tests. Get In Touch. Model: HP ProLiant ML310e G8, HP ProLiant ML310e Gen8. RAM: 4GB DDR3 RAM. All of our servers are refurbished to a very high standard. Internal parts (such as RAM and CPUs) are tested individually, and once the components are installed the system is tested in full. It is designed to provide the solid network foundation essential to fuel thriving small offices. 1 Year Free RTB Warranty. Why Buy From Us. Exceptional Service. Trusted Refurbisher. Refurb Monitors. Used Printers. Server HP ProLiant ML310 G5P. HP ML310 G5P without accessories. Modell ML310 G5p. 4GB RAM, 2x 146GB SAS HDD. 2 x 146 GB SAS HDD. DVD-RW / HP RDX-1000 drive. Produktlinie ProLiant ML. Speicherkapazität (RAM) 8GB. HDD Bays: 4 x LFF SAS/SATA. The HP ProLiant ML310 G4 is an affordable, single processor tower server designed to provide the solid network foundation essential to fuel thriving small offices. Chasis: Tower. HPE ProLiant ML310e Gen8 v2 Xeon E3-1220 V3. 8 bay SFF sas/sata hdd bay. We will resolve the problem directly with you. Model: ML310 G5p. graphics card: nVIDIA QUADRO NVS 290 (2x D-SUB). hard drive 2TB, 3.5". cpu: QUAD CORE 4x2,66MHz. manufacturer: HP. 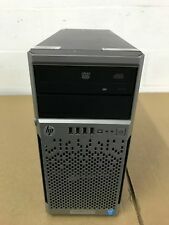 HP ProLiant ML310e Gen8 4LFF Tower Server. HP M310e Gen8. Blade Server. Server Options. Server Racks. Systemax Technologies Pty Ltd is a trusted supplier of servers, options, storage and networking products, server racks, high end workstations and much more to organisations throughout Australia. HPE ProLiant ML310e Gen8 v2 Xeon E3-1241v3 4LFF Tower Server. HPE Server Options. Four (4) HPE 3TB 7.2K 6Gb/s SAS 3.5" Enterprise Hard Drive. HPE, Dell, IBM, SUN Servers. Blade Server. Server Options. HP ML310E GEN8 4-BAY LFF HDD BACKPLATE (W / PWR/SAS CABLES). Ending Soon. New Arrivals. QUICK LINKS. Desktop PC. we do not take any responsibilty after this. Why Choose Us! Audio Visual. HP ProLiant ML310E G8. 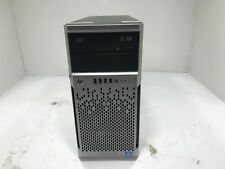 HP ProLiant ML350E G8. HP ProLiant DL 380E G8. HP ProLiant BL420C G8. HP ProLiant DL 388 G8. HP ProLiant BL460C G8. HP ProLiant DL 560 G8. HP ProLiant BL465C G8. SERVER ONLY - NO HDD'S INCLUDED - 1 x XEON CPU - 8GB RAM. Optical Drive: DVDRW. eSata port: No. Ethernet: Yes. Video: Onboard. SATA Ports: 2. PCI Slots: 0. HP 686746-001 ML310E G8 4 BAY (LFF) BACKPLATE. OUR REF SB35.